“A Moment Forever” had two years of preparation and will be the first Japanese/Taiwan collaboration to explore the theme of pets. The movie will also star a cute golden retriever Ke Le. Based on a Japanese novel, it talks about a fashion magazine editor (Janine Chang) who unexpectedly adopts a dog on the brink of being euthanised. Peter will portray a ‘house husband’-type character where he cooks everyday for his girlfriend. There will also be a love triangle between Peter, Janine and Sphinx’s characters. To prepare for the film, Peter and Janine had to become familiar with working with animals. So they started training a month beforehand to develop rapport with the dogs. Unfortunately they are both allergic to dog hairs so it was a tough challenge! Peter had an allergic reaction where he could not open his eyes as they were swollen. His nose was also running. For Janine, she would get rashes and her skin will be very itchy. So they both took different antihistamine medications and swapped tips on which ones are better. Even though Peter had to endure allergic reactions he was still willing to film because finally, he doesn’t need to show off his body. “I’ve been in the entertainment industry for so long, finally someone is forbidding me to take off my clothes. I’m so relieved!” He hopes the audience will focus less on his body and more on his face, otherwise people will forget what he looks like! “A Moment Forever” is expected to complete filming in August. Hopefully it will be released in Taiwan and Japan in March next year. When will it aired? 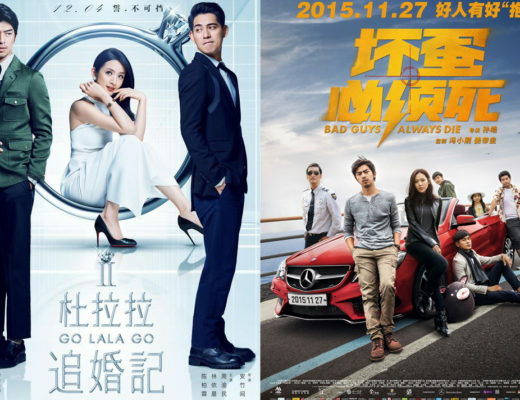 is it a movie or a drama series? I love them so much in Ring Ring Bell..
Can’t wait to watch this!!!!! Lol same! They had so much chemistry in RRB. This is a new movie which is expected to release in March next year. Long wait!!! I saw in your other post that there’s another series of the two of them… It’s three letter words. Do you know when it will be aired? Oh Le Jun Kai… it was supposed to be ‘in the first half of the year’, then it was ‘July’ and now ‘before the end of summer’ =.= argh. So annoying they keep pushing it back! Same here! Very adorable couple. Lol he’s back, and so is she! Loved them together in their previous drama – what a beautiful pairing! Peter studied in Canada so he’s very fluent. Hrm, haven’t heard Janine speak English though! But yes I love this pairing! BTW.. I’m not Chinese but luckily I can understand I bit of mandarin..thanks to all of you…..
Oh that’s great! How is ‘Shining Days’? Is it draggy?